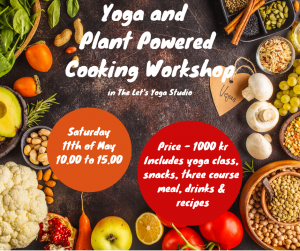 A workshop for anybody interested in incorporating more plant based cooking into their daily lives. You may already be vegan, flexitarian or perhaps a curious meat eater. Plant based living has become more and more popular in the last few years with concerns over personal health, the environment and animal welfare. The workshop includes a 90 minute yoga class, snacks, three course meal, non alcoholic drinks and recipes. Ingredients will be to the best of my ability organic. Maximum of 8 participants. Anyone over the age of 16 can attend. 13.30/14.00 to 15.00 – The best part, savour our food! 15.00 – Go home happy and full. You will be bringing home something you made as well as some recipes to try at home. My Personal Food Journey: For many years I was flexitarian/reducitarian, I ate a predominantly vegetarian diet and opted for meat/fish very occasionally. I naturally started incorporating more and more plant based meals during 2017 and then cut animal products entirely in early 2018. The best part is that vegan food can really be delicious! That is what I want to share with you on this workshop and I’m very excited about it. Contact me to book your place on this workshop.